We'll have more analysis on Ryan's incredible run later in the week, but first we'll try to give you Ryan's own assessment. It truly was a remarkable day for American distance running. 2:06:17 is certainly impressive all by itself. But Hall's accomplishment is bigger than the time. Not only did he run 2:06:17, but he went through the half way point on world record pace, and then at 25k, he had the chutzpah to go to the front and ask the pacemakers to go faster as the pace was lagging. That bold move (which eventually did Ryan in, Ryan himself said, "I made a classic rookie mistake. I felt the pace slowing down (4:55). I noticed some of the guys were struggling in our group ... and I wanted to test them out to keep it honest to see where we're at... Then they totally took it out and gapped me.") even shocked champion Martin Lel. Lel said the following of Hall, "The guy is very strong for sure. I was just running.. and all of a sudden he came to the front and he talked with the pacemaker, 'The Pace is too slow - try to push.' So I said to myself, 'Am I not running (fast enough) or what?' because we were going the right speed and the guy (Hall) was comfortable. I asked myself many questions and (realized) "Now I need to be prepared (to push harder the rest of the race)...That is why (later when Ryan fell off) I looked back to see if my friend (Ryan) was still there (close to us)." Here is what Ryan had to say on his race (plus videos from him and his coach and his parents below). 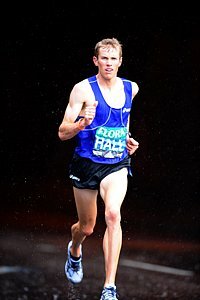 Ryan Hall's Overall Reaction: "It was a really excellent race. I was really pleased with obviously the time, but more (importantly) learning to race this style of race that doesn't particular suit me, the surging that happened all throughout the race... I definitely learned so much out there on the roads today. I'm really grateful I ran this marathon... I feel way more prepared for Beijing." "I always thought like I had a shot to win but it wasn't quite my day but I was happy with it." ""I feel like I did a good job hanging in there." On the Early Fast Pace (5k in) "At that point I was committed. It was good to have it settled in my head (that I was going with the leaders no matter what)... It's good to know I can go out as aggressively as we did today in an erratic pace way and still handle it well. On Going to the Front at 25k and urging the rabbits to go faster: "I made a classic rookie mistake. I felt the pace slowing down (4:55). I noticed some of the guys were struggling in our group ... and I wanted to test them out to keep it honest to see where we're at... Then they totally took it out and gapped me." On struggling the last couple miles: "I felt like I battled through it more a little better this year"
"I was going for it... I've never pumped my arms that hard to run 5:10 pace. When you can walk away from the finish line knowing that there is that satisfied feeling. Today this was the best I could do." On getting support from his friends and family and staying grounded (He was in particular full of praise for his wife Sara, see the video interview for more). "My preparation is going better every time I run the marathon... I get so much confidence watching Meb and Deena train... I was thinking about Sara the last two miles... She's invested so much in me." "You've got to stay the person you've always been. I've had times I've been successful and got caught in it and then struggled."